Do know what your star sign means? Star signs also known as sun signs / zodiac signs / astrological signs are an important concept in astrology. Each person is born under a particular star sign which is responsible for their personality. If you are wondering about yours, try his free star sign calculator right away! In Western astrology we have the 12 signs of the zodiac. In order these are: Aries, Taurus, Gemini, Cancer, Leo, Virgo, Libra, Scorpio, Sagittarius, Capricorn, Aquarius and Pisces. The concept of the zodiac began in Babylonia and was later influenced by the Greeks. This study strongly indicates a connection between what is occurring in the sky and the way things occur on earth. The star signs chart with 30° divisions of the Earth’s elliptical orbit help us determine where the various planets are in a particular horoscope. There are different systems of astrology and they each have a slightly different way of measuring and dividing the sky. In the Western we move from equinox and solstice, Vedic astrology actually measures along the equatorial plane. Western astrology may not correspond exactly to the current era location of the constellations but the Vedic type does. In both Western and Asian forms of astrology the movement of the sun, moon and planets are emphasized. In the Chinese astrology date and year becomes the operative factor. But in all the traditions however the zodiac sign that is ascendant at the time of birth is a major aspect. Our concept of star signs meanings is based primarily in the Greco-Roman tradition although some of the most basic concepts originated in Babylonia. The division of the orbit into 12 sectors is definitely a Babylonian concept. For the selection of your star sign, using the calendar date is essential. Let’s take a look at the 12 star signs. From this we can also evaluate the star signs compatibility. Now let’s take a look at the star signs dates, meanings and symbols. Aries: (March 21 – April 19) : Ruled by Mars, this astrological sign is symbolic of courage and enthusiasm. Taurus: (April 20 – May 20) : Ruled by Venus, this star sign is symbolic of trust and tenacity. Gemini: (May 21 – June 20) : Ruled by Mercury, this sign signifies communication, flexibility and social skills. Cancer: (June 21 July 22) : Ruled by Moon, this sun sign is symbolic of intuition, nurturing and imagination. Leo: (July 23 – Aug 22) : Ruled by the Sun, this zodiac sign represents power, confidence and responsibility. Virgo: (Aug 23 – Sept 22) : Ruled by Mercury, this astrology sign is symbolic of hard-work, organization and simplicity. Libra: (Sept 23 – Oct 22) : Ruled by Venus, this sign signifies beauty, romance and creativity. Scorpio: (Oct 23 – Nov 21) : Ruled by Mars & Pluto, this sign is symbolic of intuition, charisma and possessiveness. Sagittarius: (Nov 22 – Dec 21) : Ruled by Jupiter, this zodiac sign symbolizes sociability, energy, exuberance and adventure. Capricorn: (Dec 22 – Jan 19) : Ruled by Saturn, this sign is symbolic of ambition, caution and patience. Aquarius: Ruled by Uranus and Saturn, this star sign is symbolic of innovation, independence, generosity and detachment. Pisces: (Feb 19 – Mar 20) : Ruled by Neptune and Jupiter, this sign is symbolic of dreams, imagination, kindness and indecisiveness. Alongwith the star sign dates and meanings, there are four primary elements in Western astrology these would be earth, air, fire and water. All star signs are associated with one of the classical elements. Fire and air are masculine positive signs; while water and earth may be more introverted and female in nature. These are some partial descriptions of the elements. Fire, positive, symbol is a simple triangle and Aries, Leo, and Sagittarius fall into this category. Air, the triangle upright with a bar as a symbol, communication is one of its major aspects and Gemini, Libra and Aquarius fall into this category. These are considered self-expressive signs. The negative sign Earth is represented by an upside down triangle with a bar. Practicality is a common term for this group and these consist of Taurus, Virgo and Capricorn. Water which gives empathy and is represented by a simple upside down triangle. It is associated with Cancer, Scorpio and Pisces and is self- containing. Each elements has three modalities. Cardinal, Fixed, Mutable. The division of the four modalities is traditional. The Cardinal signs are Aries, Cancer, Libra and Capricorn. The fixed are Taurus, Leo, Scorpio and Aquarius and the Mutable zodiac signs are Gemini, Virgo, Sagittarius and Pisces. The element and modality are basic aspects of the sign. Capricorn is a cardinal earth and it takes action in the material world that can be either ambition or practical application to the necessities of life. Each star sign is ruled by a particular planet in traditional Western astrology and is controlled by one of the seven planets. Aries relates to Mars, Taurus relates to Venus, Gemini relates to Mercury, Cancer relates to the Moon, Leo relates to the Sun, Virgo relates to Mercury, Libra relates to Venus, Scorpio relates to Mars, Sagittarius relates to Jupiter, Capricorn relates to Saturn, Aquarius also relates to Saturn, Pisces relates to Jupiter. Many believe that Uranus is also connected to Aquarius and this may be because of which the Aquarians have a tendency to be slightly unconventional. There are also other combinations of planetary rulerships for star signs for example Pisces being ruled by Neptune and Jupiter. The traditional setup was extremely symmetrical. In Western astrology you will find that your star sign is determined by where your sun is placed in your horoscope depending on your date and time of birth. 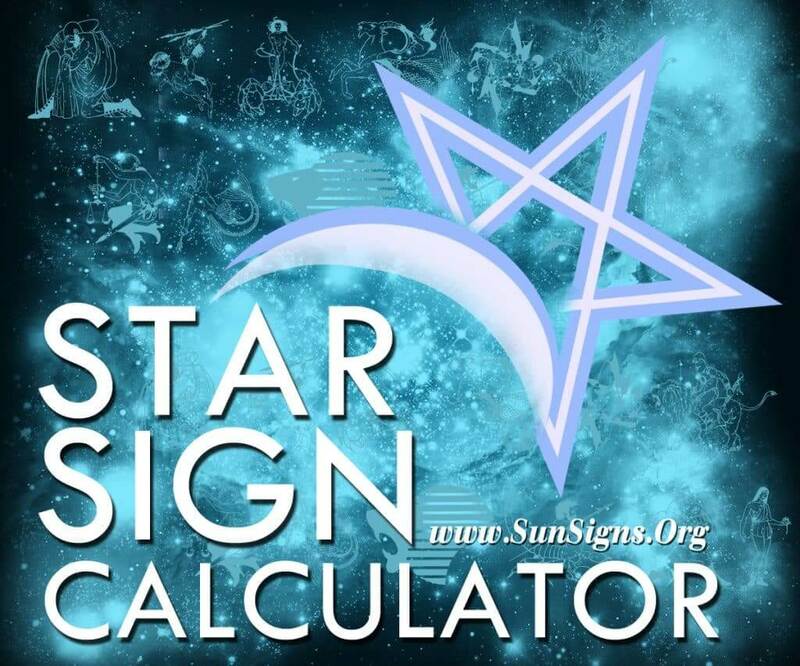 This Star Sign Calculator helps you find your star sign based on your date of birth in seconds! Also find out about your star signs love predictions. Find out about your star sign today! Why Red Meat Is Bad For You?